Weaving Theology in Oceania: Culture, Context, and Practice. The theme of weaving has a long tradition in the island nations of Oceania. Throughout the conference of the Association of Practical Theology in Oceania (APTO), Fijian participants shared the wisdom and practice of the traditional weaving of mats and their significance in island cultures; delegates had an opportunity to witness and experience the use of these mats in a variety of ceremonies/settings – welcome, prayer, reconciliation, celebration, and farewell. The symbol of the mat, and the disciplined craft of weaving, unravelling, and re-weaving, enabled participants to grasp and articulate the complex task each was undertaking personally, as well as the process that was shared and experienced together – that is, encountering the differences in culture, weaving together a theology that critically reflects on our shared Christian mission and pastoral practice in a vast array of contexts, cultures, and pastoral settings, while addressing a variety of pastoral concerns, including climate change, spousal violence and abuse, and the exclusion or undervaluing of women. Is it the role of men or women, or both? Is it an individual or communal exercise? How important is unravelling and reweaving? Who does the unravelling and reweaving? What is the purpose of the weaving: practicality or beauty, creating a mat for special occasions, or for everyday functionality? Who will be welcome to sit on it? The related concept of ‘Talanoa’, i.e. sharing and story telling, also emerged as an Oceanic notion of great significance. This concept is not simply about the story that is shared, i.e. about the content of what is told. Rather, it is also about creating a space where the telling of the story can take place without concealment; where everyone is heard and respected, and all stories have value and should be heard; where there is intentional, compassionate, and deep listening; and where hospitality is offered and valued. The rolled mat symbolises an invitation to story telling; the rolling out of the mat creates the space for story telling or sharing. The conversation/dialogue that emerges from the story telling leads to a deeper sense of belonging together in God, without having a pre-determined, or pre-conceived agenda or idea about where the talanoa might go. Talanoa is never complete, which suggests (as one Conference keynote presenter – Rev Dr Seforosa Carroll – observed) that the mat, and the weaving of the mat, is never complete. Rather weaving is an on-going process of re-weaving and extending. At the close of the conference, one of the participants observed that the seminarians and staff of the Pacific Regional Seminary, and the groups and choirs from the broader local faith communities, embodied the practice of hospitality and welcome for participants throughout the conference. Indeed, this was true also of the people of the village of Vanuakula in central Fiji, who welcomed APTO members into their Sunday celebration of Eucharist on the first day of the conference, which began with an excursion to their parish. 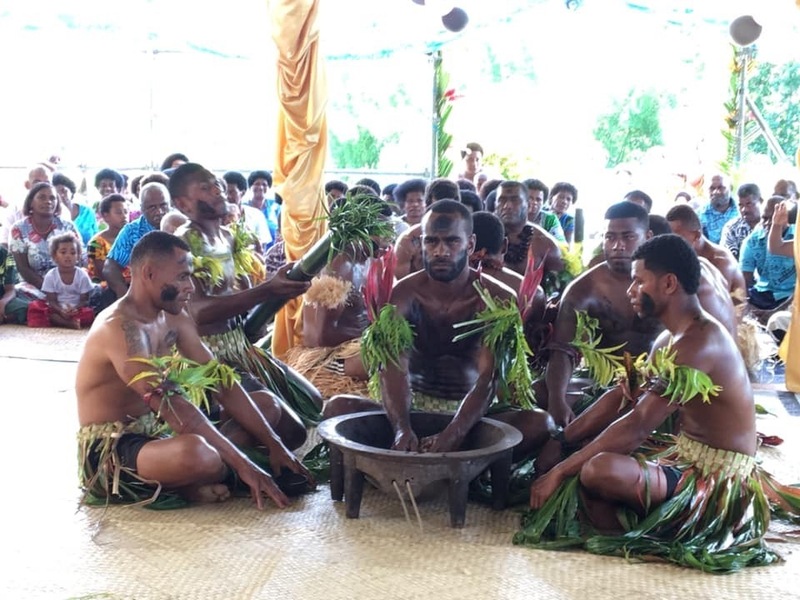 They also offered the hospitality of food and of a traditional Fijian welcome ceremony, which included the symbolic offering of ‘Tabua’ (a valuable whale’s tooth) and the serving of ‘Kava’ (a drink mixed from the root of a Kava plant, mixed with water and filtered through silk cloth). The kava was mixed in the ‘tanoa’ mixing bowl, served in a Bilo (a cup made from half a coconut shell). The entire ceremony was a powerful demonstration of the respect offered to the other, and the value and esteem with which the other is welcomed. In the first keynote address, Rev Dr Upolu Luma Vaai observed that the character of the Oceanic islander people is to allow room for the other person and to allow for a ritual respecting of the connectedness of everything to the whole. The Fijian people embodied this in a very meaningful way, bringing to life the theological framework that slowly emerged over the course of the conference – the sense of the interconnectedness of all of life – not just the interrelatedness of different peoples and cultures, but also the interrelatedness of people with all of creation. As Archbishop Loy Chong noted, symbols such as weaving and story-telling allow us to re-weave meaning in our lives, to reweave the meaning of the interconnectedness of life, a meaning that our world is in danger of losing. The role of practical/pastoral theologians, pastoral practitioners and ministers, and of churches more broadly, is to empower the voiceless, to take up the prophetic challenge of challenging harmful practices, and re-weave our theology so that it more consistent with the Trinitarian framework that views all of life as intimately related.